How Good Could Marvis Frazier Have Been if “Smokin” Joe Didn’t Take Over in the Corner? Marvis Frazier the son of “Smoking” Joe Frazier was an all-around top athlete at Plymouth-Whitemarsh H.S. when he went to the Joe Frazier Gym to keep in shape for the upcoming year in sports. He got the bug and gave it all up at the school. Joe turned Marvis over to former top professional boxer and then trainer George Benton who was a future IBHOF trainer. In four years Marvis compiled a 56-2 amateur record. He defeated such boxers as future professional world champions James “Bonecrusher” Smith and “Terrible” Tim Witherspoon. He also defeated Mitch “Blood” Green in the Olympic trials who was a 4-time New York Golden Gloves champion and Jimmy Clark who defeated Greg Page in the 1977 Golden Gloves championship bout. Marvis suffered but two defeats during his amateur career against future professional world champion Tony Tubbs and being stopped by James “Broad Axe” Broad in the 1980 Olympic Trials. In 1979 he won the Junior Heavyweight World title. In 1979 Team Frazier consisted of Pennsylvania Golden Glove champion Lonnie Young, who would die in an airplane crash in Poland. Joe had a dream that if he left Marvis go on that plane there would be trouble so he wouldn’t let him fly there. As it turned out President Jimmy Carter refused to allow the USA boxers go to the 1980 Olympics. Also members of the team were Myron Taylor the older brother of Meldrick Taylor and Roland Cooley who was a National Golden Gloves Champion, Marvin Richardson. The brothers Marvin and James Shuler were members with James winning the National Golden Gloves championship. Also a member was Vaughn Hooks along with Marvis. Why Joe ever took over as trainer replacing Benton who directed Marvis through the 56-2 amateurs was a big mistake. While Joe was down at a Boy’s & Girls Club in Wilmington, Delaware the year of his death this writer asked him “when did you start training Marvis?” He replied “when he turned professional”. I bit my tongue not asking why replace Benton? This writer once was taking a picture in a Philly gym for boxer Mario Saurennann when I heard a voice behind me say “move or I’ll use you as a heavy bag!” I turned around and it was Joe. I almost made the mistake of saying “if I was Sonny Liston you wouldn’t say that!” Joe’s brother Tom asked me to serve as matchmaker for Team Frazier with several of the boxers turning pro. This writer told him “on one condition. That Joe wasn’t involved”. When I followed Tom up the stairs in the Frazier Gym to the office Joe took one look at me and said “is this the guy?” I immediately said to Tom “what did I tell you” and exited the office and the gym. This writer only saw Marvis fight once as an amateur I believe for the State Golden Gloves title at the Blue Horizon narrowly defeating a kid I believe named O’Donnell. Marvis was definitely not the size of a heavyweight on today’s standards. Why Joe signed Marvis with the Madison Square Garden in New York this writer made no sense. A black boxer from Philadelphia would not be so ideal. If he was Puerto Rican that would be different. The signing bonus was 25k and shortly after that Joe opened a bar called “Smokin” Joes on City Line Avenue in Philadelphia that later burnt down. Marvis once told this writer “I insisted James Shuler would be part of the deal.” Shuler was a top notch professional known as “Black Gold” who lost after twenty-two wins defending his NABF title to Tommy “The Hit Man” Hearns in the first round. A week later he was killed in a motorcycle accident. Buster Custus named his gym The James Shuler Gym in West Philadelphia which is one of the top facilities in the city. Joe had a local Philadelphia furniture dealer Joe Verne brought in as the manager. For some odd reason Marvis never fought in Pennsylvania let alone Philadelphia in his twenty-one professional fights which was another bad decision. The Frazier name was so well known in Philadelphia where Marvis would have fit in perfectly. After Marvis won his first four fights at the Felt Forum in New York he would never return to fight in New York again. He had defeated James Broad in their rematch in the pro’s and in his tenth fight defeated Joe Bugner who Joe had defeated. 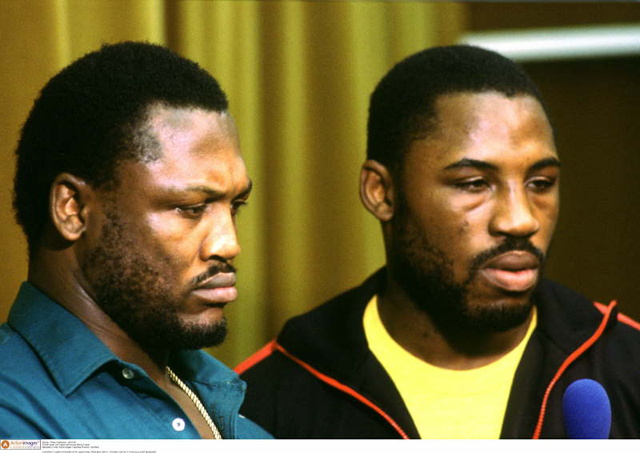 One of the biggest bone head match-ups had Marvis 10-0 in a non-title bout with 44-0 Holmes who had 17 defenses. How the Nevada Commission even sanctioned such a fight is beyond this writer. Unfortunately for Marvis the referee was Mills Lane. Holmes peppered Marvis with a jab early in the round then pulled his usual dirty tactics of throwing Marvis into the ropes with not even a warning from Lane. Holmes would continue his dirty tactics putting his left straight arm (football style) into the face of Marvis following with a right hand. He also was grabbing him behind the head hitting him with a right hand without warning from Lane. It bothers this writer when a boxer is superior to his opponent and has to add insult to injury with dirty tactics. The fight was stopped in 2:57 of the first round. Rumors were Holmes said “that’s for all the lickings your daddy gave me in the gym.” Marvis would later state “I thought I was ready for him.” In the after fight interview he said “I didn’t want to hurt him.” He also made that statement after stopping Muhammad Ali in the latter’s only stoppage loss. Ali gave Holmes many a beating when Holmes served as his sparring partner. This writer doubts if he meant it either time. Marvis would not fight again for almost two years. The only other loss that Marvis suffered was a devastating knockout by future world champion Mike Tyson who was 24-0 with 22 knockouts at the time while Marvis was 16-1, in 30 seconds of the first round. “I thought Tyson was just another guy who was going to be a statistic. Yeah that’s what I thought. I threw a jab and that’s all I remember,” said Marvis. He would not fight again for 11 months. Marvis won his last three fights with two being in Secaucus, New Jersey, and the final one in Tucson, Arizona, defeating Phillip Brown, 31-2-2, over 10 rounds. “I knew it was my last fight (Brown) before I took it,” said Marvis. In his previous fight he defeated Robert Evans, 6-12-3, over 10 rounds. He only had twenty-one fights over eight years in the pro’s while having 56 in four years in the amateurs. Such sudden inactivity didn’t help any. He was 28 when he retired. If only the cruiserweight division was in effect. Marvis served as the 1992 US boxing coach and was inducted into the PA BHOF in 1996. He took over Joe’s Gym training and managing it until 2008 when it closed down. “It crushed me,” said Marvis. The gym wasn’t the same when this writer last visited it with few boxers training there.